Yankee Candle has outdone itself this year with the introduction of three different advent calendars just for you. This is a pretty expensive advent calendar as it’s an eye-watering £74.99. It contains 24 numbered boxes containing sweet-smelling winter candles – two small jars, 12 votives, six wax melts, a smart scent vent clip, a wicker trimmer, a sniffer and an exclusive votive holder. This one has a variety of 24 tea lights. Cute, right? It’ll set you back £24.99. These contain a mixture of 12 votives and 12 tea lights. It’ll set you back £34.99. Christmas is coming. Whether we like it or not, it’s happening. Luckily for us, there’s certain things that come out this time of year that make us feel better about the rubbish weather and the fact we’re piling on the pounds due to all the hot chocolate and comfort food. One of these things has to be Soap and Glory. Their Christmas range is always a sell-out and just generally brilliant. This year, there’s a new advent calendar filled with all of our favourites. It’ll set you back £40 from Boots but can you really put a price on happiness? The calendars are on sale as we speak. Check them out here. If you love nothing better than dunking a biscuit into your cuppa, then you’ll be thrilled to know that B&M has just launched a McVitie’s biscuit advent calendar. Now, you’ll have a surprise biscuit every day of December. The store said: “When it comes to classic chocolate advents, those tiny little pieces just aren’t enough so the discount retailer have put a twist on tradition and launched a McVitie’s biscuit advent calendar! Remember that incredible cheese advent calendar from last year? Well, it’s back. The calendar will set you back £10, but it contains seven varieties of cheese, including Jarlsberg, Applewood, Edam, Red Leicester, Wensleydale and Cheddar. There’s also a limited edition ginger cheese, too. Each cheese is individually wrapped. But before you worry about harbouring a huge advent calendar in your fridge for the whole of December, they’ve thought about that too. The calendar opens like a book so you can tear it in half and throw half away once you’ve got half-way through. Speaking to the Liverpool Echo in 2017, the creator Annem Hobson said: “Cheese. I love it. I’d go as far as saying I love it more than chocolate. “After searching high and low and discovering there shockingly wasn’t already one on the market, I launched a campaign after creating one handmade prototype last Christmas. The calendar goes on sale on the 14th November in Sainsbury’s. ‘Shiny Little Things’ contains 24 mini and full size MAC products, including cult classics Velvet Teddy lipstick, Feline eye pencil, Ruby Woo Lipstick and Woodwinked eyeshadow, reports Cosmo. It isn’t cheap though, and will set you back a cool £125. But… just LOOK at it. Those lashes have got my name all over them. The calendar is available from October 18, and (if you can manage to stop yourself from opening every door at once) it’s sure to make December just that little bit more exciting. Funko has released a brand-new advent calendar, and this is something you actually might want to buy early as it’s almost definitely going to sell out immediately. It’s full of Harry Potter miniatures, so you can build your very own Harry Potter scene. Amazing, right? The calendar is on preorder right now, to ship on Nov. 17 — you can snag one on Amazon, where it’s retailing for $54.99. The wait is finally over for JD dreamers as Jack Daniel’s unveils its very own advent calendar for 2018. We’re all for a festive tipple here, and now we can combine the joy of opening a tiny door with the joy of opening a tiny bottle of Jack Daniel’s. Sure, you might think of sherry or brandy this time of year, but why not douse that bland Xmas pud in some sweet Tennessee whiskey and bring the taste of the country to the Christmas dinner table. Offering 23 miniatures, The Sun informs us that the Jack Daniel’s advent calendar gives you around 1.2 litres of the good stuff. Costing the princely sum of £60, you can get the same amount for cheaper elsewhere, but there’s no fun in that. Only available to buy in Asda, the Jack Daniel’s calendar has something over the rest of the competition. While munching through the same chocolate for all of December can get pretty monotonous, the Jack calendar offers a variety of flavours. For your £60 you get mini bottles of Jack Daniel’s No. 7, Tennessee Honey, Tennessee Fire, Gentleman Jack, and Single Barrel. As a final treat, one of the doors also contains a 5cl Jack Daniel’s hip flash that conveniently attaches to your key ring. We obviously don’t condone drinking at work, but a nip of Jack would definitely perk up that morning coffee. You could always give the hip flask to someone in Secret Santa and pretend you put a lot of thought into their present. If you can wait all 23 days, the Jack Daniel’s calendar will bring a little bit of liqour to your days, or you could open them all at once and have one particularly interesting evening. The festive season is already well underway, and as we try to pick that all-important advent calendar, the best brands out there are trying to get our attention. Shared by Money Saver Online, the site could hardly contain its excitement that B&M is bringing back its Pringles calendar. If you weren’t already sold, the tempting price of £7.99 is sure to force a few Pringles patrons to part with their cash. Although you get a mini can of your favourite flavour, there are only 12 doors to open. Don’t worry though, that’s still plenty of Pringles to munch through for the 12 Days of Christmas. Also, I can think of worse mornings than waking up to a tub of Pringles. Whether crunching through a 40g tub of Original, Sour Cream & Onion, Salt & Vinegar, or Texas BBQ Sauce, there’s something for everyone and the Merry Pringles advent calendar is sure to be another big hit. It’s a little disappointing that fan-favourite flavours like Steak, Paprika, and Nacho Cheese aren’t behind the doors, but who knows, maybe Pringles will gift us a proper calendar next yet? If you haven’t already raced to the bargain store to pick up your Pringles calendar, you probably should. Crisp addicts saw the benefit of a festive Pringles calendar last year and the entire stock was sold within days. Forget a cheese advent calendar or one where you get tiny bottles of gin, who really cares when the other option is those salty little discs of joy? Safe to say, Money Saver Online’s post has already gone viral and gathered hundreds of comments. If stocks do sell out, the calendar is available to buy on Amazon at the inflated price of £20. Pray to the Pringles gods that there are still some calendars out there somewhere. If not, add them to your Christmas list and post it to Santa ASAP. Cue some Darth Vader-inspired heavy breathing, LEGO is bringing back its Star Wars advent calendars for 2018. From casual fans to full-blown Wars whores, this is one Christmas collectible that everyone will want hanging on their door this year. The world of LEGO Star Wars started back in 1999 and has expanded quicker than Han Solo can do the Kessel Run. After the runaway success of LEGO’s Star Wars calendar last year, the brick-building behemoth is cashing in on that Christmas cheer all over again. Available now from the LEGO Store, the Star Wars advent calendar offer 24 chances to build your own Empire or Rebellion, First Order or Resistance. Someone is obviously just going to open all the doors at once, but where’s the fun in that? Although there are no Wookiees or Darth Vader, the joy of opening an advent calendar has never been so magical. Also, while characters like General Merrick and Guavian Security Soldier may seem like a wasted door, there are plenty of memorable characters. LEGO fans will notice Rowan from LEGO Star Wars: The Freemaker Adventures, while The Last Jedi‘s Rose Tico is also a must-have collectible. Blast your way across the galaxy in General Grievous’ Starfighter, take on a rathar, or display a Christmas-themed moisture vaporator on your windowsill. Also, once you’ve opened the calendar, you can play with your new minifig’s on the specially-designed playmat. Before anyone asks, no you’re never too old to play with LEGO, just try not to choke on the small parts. Last year ‘may’ have been slightly better with the likes of the Millennium Falcon and Santa BB-8, but 2018’s Rebellion snowman is still pretty cute. Don’t worry though, the 2017 edition can still be found over on Amazon. At £24.99, the calendar is a little more expensive from those chalky chocolate ones your nan gives you, but come on, it’s LEGO STAR WARS! Christmas is but a mere four months away, and while it still feels like we should be trying to make the most of any ounce of summer that is left before autumn arrives, shops and retailers don’t think that way. For them, Christmas starts in June and the build-up is just the longest period in the world. I used to work in hospitality, and we’d start planning our Christmas menu in April, so I’m definitely one of those that is all about waiting until the right time to PROPERLY enjoy the festive season. However, this bit of news about Primark’s latest Christmas offering is just too good to keep quiet, and while it may be a few months away you’re definitely going to want to keep this in your calendar, as they’re likely to fly off the shelves once they’re introduced onto the shop floors. Remember last year, Primark officially dropped some absolutely STUNNING Disney Christmas tree baubles? There were Mickey Mouse ones, Minnie Mouse ones, Beauty and the Beast ones, and they were all ranging a fiver or so each? Well, turns out the retailer has thought much bigger this year round – as they’re bringing out an entire 25 day of Christmas advent calendar. Oh, boy! 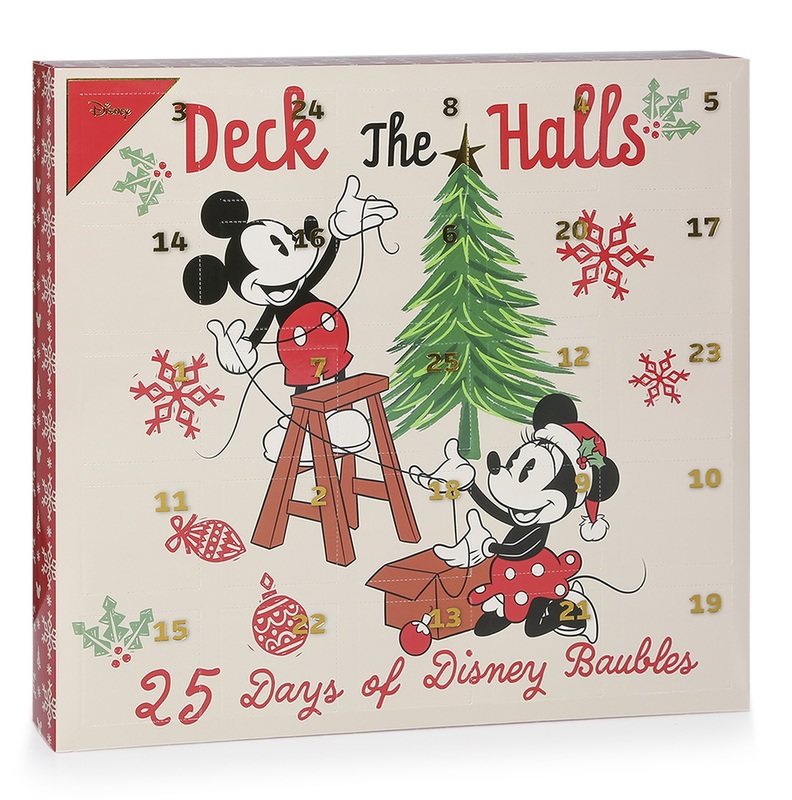 The 25 Days Of Disney Baubles collection will set you back £15, and works out at around 60p a bauble. I would bet my last quid on what everyone’s Christmas tree theme is going to be this year.